Andy Kendrick has always dreamed of bigger things than tiny Eagle Bluff, Arizona. So when the opportunity arises to shake off the dust of his hometown and move to the tropical paradise of Hawaii, he grabs it. But he never imagined that apiece of his past would follow him to his new life . . . Kimberly Briggs has lived her life on the fringes of the crowd, timid and afraid since the death of her brother, but when she learns that Andy, her lifelong crush, is moving to Hawaii, she's finally ready to step out of the shadows and take a risk. Kimberly is the last person Andy expected or wanted to see in Hawaii. But when fate incessantly throws the pair together, there's little to be done but make the best of the situation. As the awkwardness fades and Kimberly begins to emerge from her shell, Andy realizes there's much more to her than he realized. But even as they revel in the adventures of island life, drawn together by a growing attraction, an unforeseen peril threatens Kimberly's life. Can the once-timid young woman now draw upon the inner strength Andy has helped her discover so the two of them can build a life together? Will Andy grasp that love knows no geographical bounds? First off I just have to say that I was glad to discover when reading the book that Kim does not follow Andy to Hawaii like it says in the synopsis... she moved there first in fact! It relieved my mind to know that she wasn't that stalker-obsessed with him and their meeting again really was a true coincidence. I totally identified with Kim's unrequited crush from elementary and high school- there's something about confident and charismatic boys that shy girls really admire and fall for. As an art major I loved that Kim was an artist and one of the ways she took risks was through her artwork. 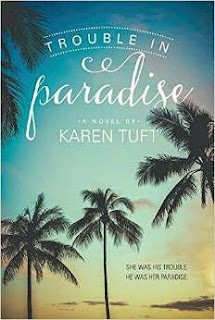 The Hawaiian setting was awesome- the author did a fabulous job painting a picture of the environment, culture, and community. The bit of mystery and action spiced up the plot and created a nail-biting climax. Since the characters are Mormon there are some occasional references specific to the religion but I think any Christian would enjoy this book.